When it comes to social media, you can measure the success of your social media efforts all you want, but if you aren’t comparing your results with those of your competitors, you’ll never be able to fully gauge how well you are doing. The best way to leverage social media tools and outcomes is by analyzing the efforts of your competitors in detail. You can then optimize your social media behaviors in a way that produces one or more desired outcomes. Performing a competitive analysis as well as benchmarking need to be at the heart of your social media strategy. While each company has its own brand and goals, the execution tactics that you and competitors take will likely be similar. If you can pinpoint which tactics work and which ones don’t, you don’t have to waste your time or money on the ones that will only render invaluable, and the best way to pinpoint them is by measuring the social media efforts of your competitors. Social media tracking tools like Unmetric help to automate this process and provide more indepth analysis that you might be able to do alone. When measuring your engagement rates, you need to use a tool that measures the rates of competitors, too. After all, if you’re only measuring your own rates, how will you know whether or not your rates are staying ahead or behind the competition? It’s also through engagement rates that you can identify growth opportunities, which is paramount to any form of social media success. Unmetric allows you to easily compare any brand with its competition and help you understand the engagement each brand is receiving along with a industry benchmark. Measuring your competition on social media helps give you context of your own efforts. In addition to detailed engagement rates, you also need to know how your blog or website content stacks up in real-time to your competitors, and there’s no better way to do this than by using Buzzsumo. As you continue to monitor which pieces of content are constantly staying at the head of the game, you can then adjust your content to what’s working best for your competitors. Do keep in mind that optimized content is the best, and the key way to optimize it is by publishing high-quality content each and every time. As you improve your content, valuable data can be collected, which will show you where you stand against your competitors. Competitor research gives context to your own efforts. When you compare your brand on social media to the brand of your competitors, what results are you getting? Are you finding that your brand doesn’t quite stack up to those of your competitors? What is different between your brand and that of your competitors that could be causing them to receive so much attention on social media. And before you hop to the conclusion that attention is always good, you must first identify which brands are receiving positive attention and which ones are receiving negative attention. You’ll want to study both types of competitors’ social media strategies, this way you know which ones to follow and which ones to avoid. How does your content reach your audience? Does your content reach 5,000 people a day and attract 3,000 comments? If so, that’s great. But what if you could see how much attraction your competitors are getting? Fortunately, social media competition tools make this possible. You’ll not only be able to measure how much attraction they are getting but the exact type, too. You’ll see the number of admin posts, fan posts, comments, Likes and more of your top competitors, which allows you to better align your social media strategies in a way that produces competition-worthy results. How fast are your competitors’ response times? When customers take to social media and reach out to their favorite brands, they expect a response within a timely manner. What about your company? Are you able to respond in timely fashion? How about your competitors? How fast are they responding? Research shows that nearly half of all social media users expect a response within an hour after reaching out. But this standard shouldn’t be what you strive to achieve. If you find that one of your competitors most frequently responds to social media engagement within 20 minutes, you should be doing the same, preferably better. By setting such an impressive standard, you are able to distinguish yourself from the competition, and consumers will greatly remember and appreciate your efforts. They will also reach out through social media to let their friends and followers know how impressive your company is at handling all of its customer service activities, including those that take place via social media. 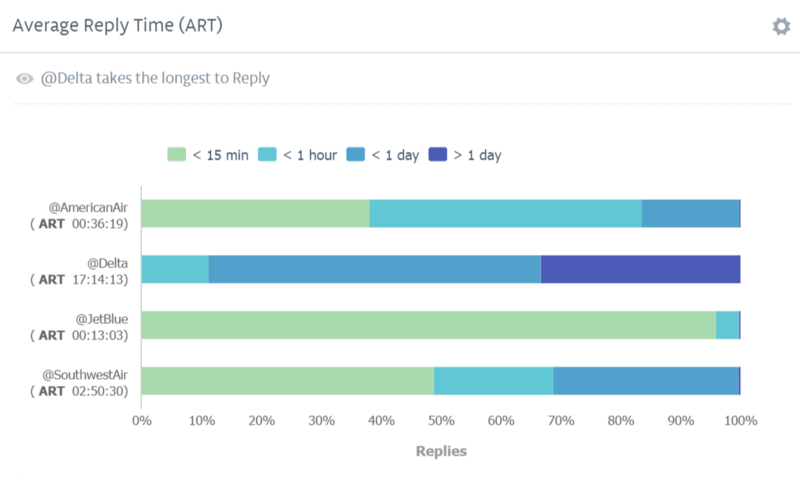 The average reply time (ART) is a metric that the biggest airlines in the world keep an eye on. Travellers tweet to airline Twitter handles to get the latest information on anything and expect replies within in minutes. Below is a comparison chart of 4 airlines and their respective ARTs. As you can see @JetBlue has the fastest ART. Unmetric offers the following metrics and more. If you’re just now exploring the idea of doing social media competition analysis, there’s no need to fret. There are many affordable, some free, tools that you can use to get a valuable insight on how your social media efforts are performing as well as those of your competitors. As expected, you should have a profile on Facebook, the most widely used social media platform ever. 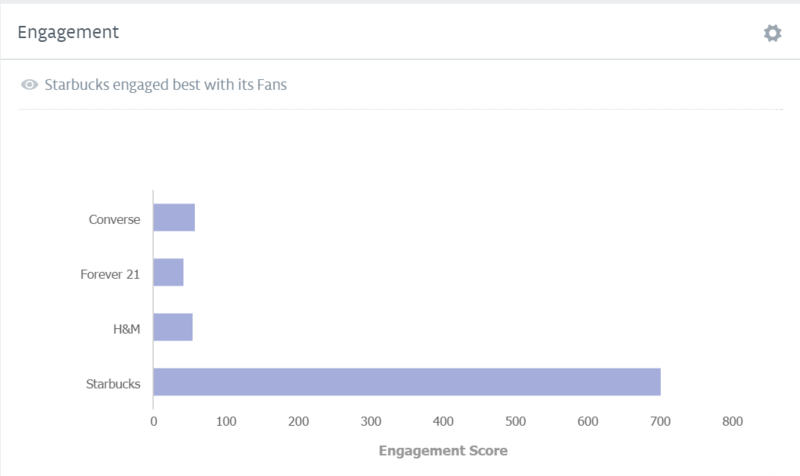 Facebook Insights lets you track user behaviors on their pages, which helps you know how to best connect with your target audience. If you prefer, you can even view which channels are the most effective as well as the location of the users who are most likely to purchase your product. When it comes to Twitter, you’ll do well to use the Topsy tool. This simple-to-use tool provides basic services free of charge, allowing you to see who is most influential according to links, tweets, photos and more. Simply enter in your brand’s name, and watch the data roll in. You can also enter the products and names of your competitors to see which tweets, links and postings are performing the best for them. The tools mentioned above are good for small businesses or brands that haven’t employed a full time social media team, but for something more comprehensive, you need a platform that provides competitive intelligence on a range of social networks and goes beyond just the numbers. Unmetric has this capability which lets you measure your competition on not just metrics like engagement and growth but also against social media campaigns and customer service. As you develop your overall marketing campaign, keep in mind that social media must compromise a large portion of it. And while it’s extremely imperative that you analyze your efforts, you must also see how well you are holding up to your competition, and the best way to do this is by taking advantage of a social media competitor tool that are available for you to use. The key aspects to look for when measuring data are those related to failure. By avoiding these aspects and strategies, you can be on your way to a social media campaign that provides nothing but positive results. Curious to benchmark your competition ? Click below to take Unmetric a social media competitor intelligence tool for a spin.